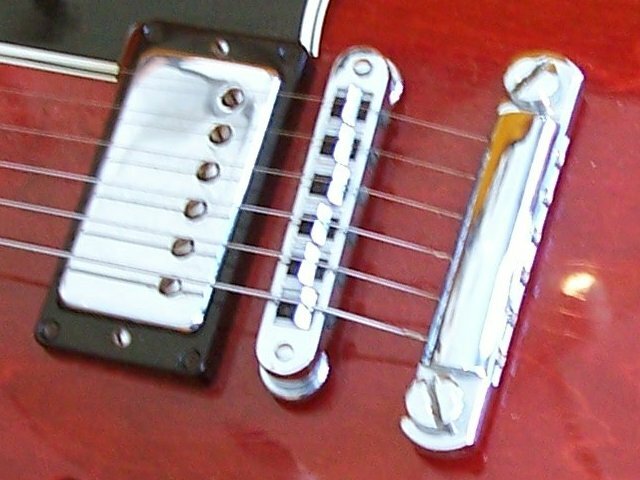 This has been Reproducded by kind permission of Danelectro who posted thie thread on The Les Paul Forum. The first step was to pull the bushings. 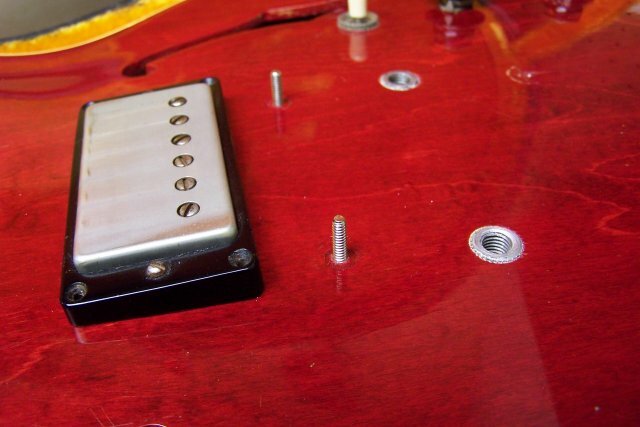 Whoever did the stoptail conversion, I must give them credit, because the bushing holes were cleanly cut and perpendicular to the top of the guitar. I turned down the diameter on the end of a piece of maple dowel rod to be an exact fit in the old bushing holes. I pre-drilled holes in the dowels so that I could double check the alignment before gluing them in place. I then cut the plug to length and sanded the end of the dowel to match the contour of the body. I experimented with some stains I had, but what I found was the perfect match happened to be a simple red magic marker. The plugs were glued in and once they were dry, I tapped the threads and touched up the end of the dowels with lacquer. 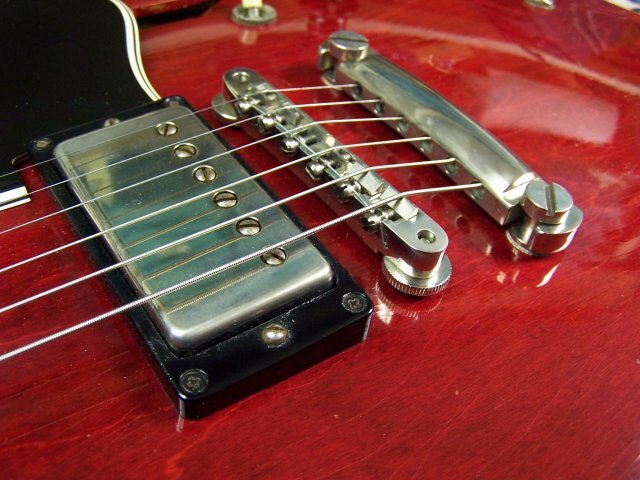 The stud height isn't real consistant on Gibson guitars from what I've seen, and I don't really think its that critical. Typically, the stud height is set so that it slightly below the top of the bridge when it is set for normal action height. When I assembled the studs in my 335, I set screwed them in such that they would end up being 1/16" below the top of the bridge. 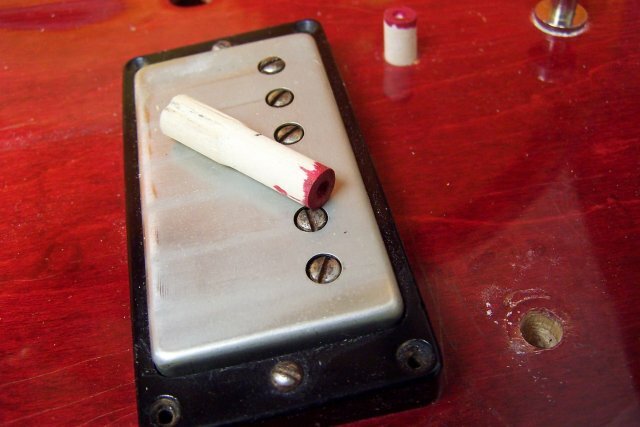 If you don't want to tackle the job of plugging the bushing holes, you can still add an ABR by making a slight mod to the bridge itself. The post holes on a Nashville measure about .165" diameter. The holes on an ABR measure about .157". The hole spacing is the same. 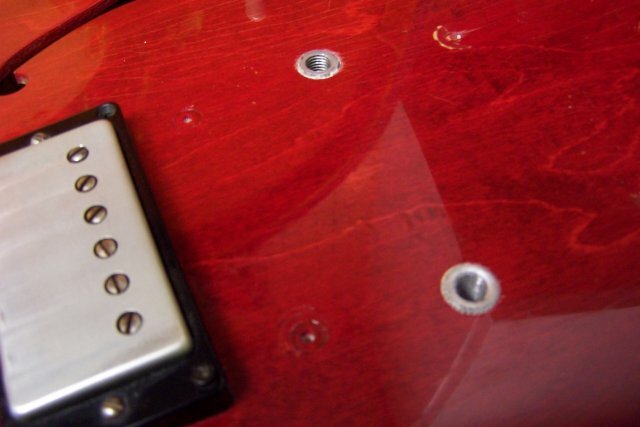 If you drill out the holes in the ABR to .165", the bridge should fit onto the Nashville studs. NEVER use a pair of pliers to install or remove studs. I don't know how the pros install studs, but here the method I use and it works very well. 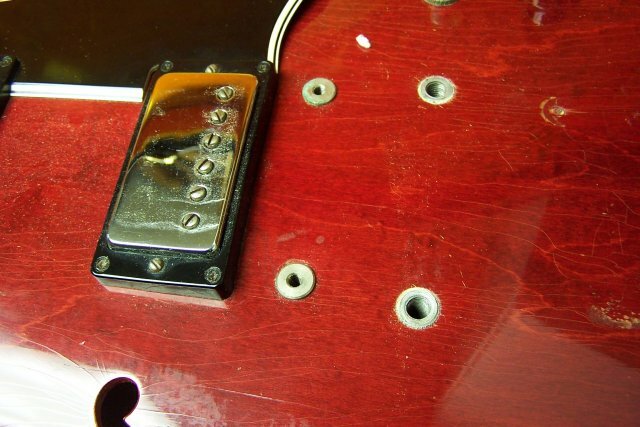 Below is an example of how to remove studs. Installation is the same process. First, you need two 6-32 hexnuts.Thread both nuts on to the stud and use two 5/16" wrenches to tighten them against each other. This locks them onto the stud and they won't slip when turned. You can now use a socket or nutdriver to remove or install the stud. When you have the stud set to the height you want, use the two wrenches to break the nuts loose from each other and remove them. 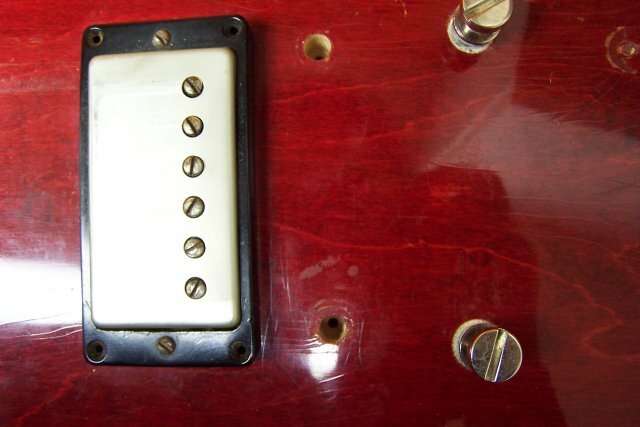 The threads of the stud are not damaged in any way. Thanks Dan for letting me reproduce this.